Bollywood celebrities diary - Pooja Hegde, Kapil Sharma, Malaika Arora spotted! Home Actors Bollywood celebrities diary – Pooja Hegde, Kapil Sharma, Malaika Arora spotted! Bollywood celebrities diary – Pooja Hegde, Kapil Sharma, Malaika Arora spotted! Apart from their busy schedule, Bollywood celebrities often step out for just a casual stroll make a good balance between work and leisure. Malaika Arora is the one who often steps out to spend time with family and friends. The actress was seen at her casual best post dinner with her mother, son Arhaan and nephews. Malaika looked pretty in casual outfit with a jacket and smiled and waved for the shutterbugs as she drove away in her car. Meanwhile the airport saw comedian Kapil Sharma and Pooja Hegde on travel schedules. 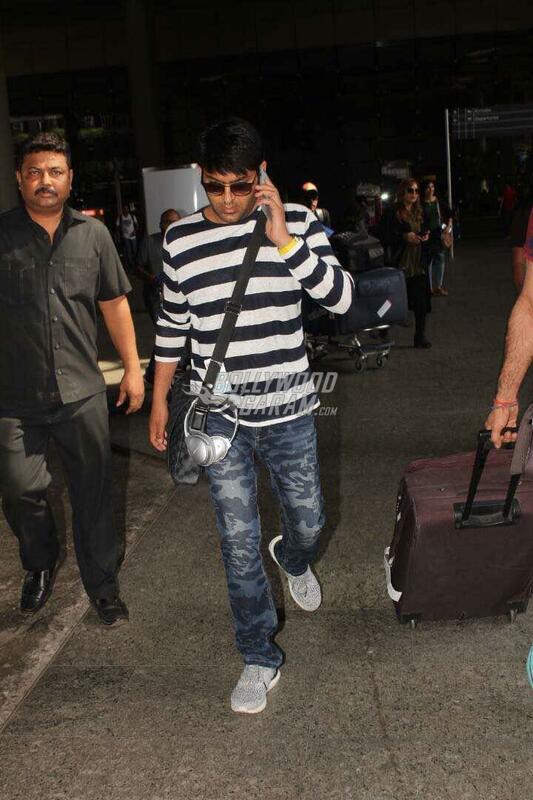 Kapil Sharma seemed in a serious mood and made his way through the airport while talking on his phone. The comedian, was seen in a striped pull-over and a pair of denims. Kapil’s show, The Kapil Sharma Show recently completed 100 episodes. Actress Pooja made a dazzling appearance in an off-shoulder white top and a pair of denims. The Mohenjodaro actress smiled, posed and waved for the cameras at the airport. Pooja is currently working for the upcoming Hindi film Adhoora which is in the pre-production stage. Previous articleActress Neha Sharma launches her official mobile app - Photos!